What Is Your LinkedIn SSI Score and How To Find It? 2019 is going to be a big year for LinkedIn. If ever there was a time to get serious about LinkedIn, it’s now. Regular readers will know how much we love to measure things, so I’d like to introduce your SSI score for LinkedIn. 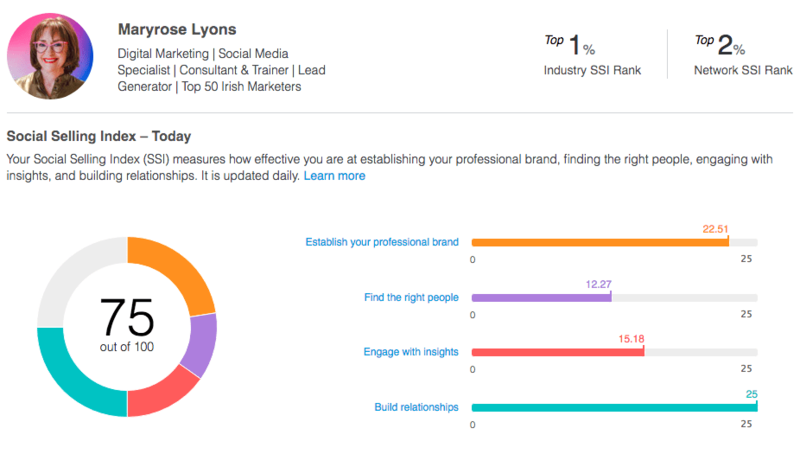 SSI is a score from LinkedIn based on how effectively you portray your professional brand, build relationships, find the right people, and engage with insights. This is known as your Social Selling Index, or SSI for short. Are you curious to find out how your LinkedIn profile stacks up against your connections and other people in your industry? Find your SSI score here. So what does your score actually mean? We’ll break down each scoring component to make it simple. You’ll get top marks if you have a complete profile, meaning you have a profile picture, headline, summary, and experience filled in. You will also want to post relevant content and interact with your network’s content. Solidify your profile by receiving endorsements from your connections. Grow your connections and build strong relationships by reaching out to 2nd degree connections, joining groups with like-minded people, or engaging with users who have viewed your profile. These actions will help you build a relevant network. Don’t put too much weight on this score – insights are mainly a function of LinkedIn Premium accounts, so you’re unlikely to score high unless you’re willing to pay. Aside from actively using insights, you can increase your score by engaging with content that your connections post. One of the major benefits of LinkedIn is that a majority of B2B buyers prefer to interact with salespeople that are referred or introduced by someone they know. That’s why it is so important to build strong networks and strengthen the connections that you already have. You can boost your score by engaging with decision makers and nurturing your relationships over time. If you can establish yourself as a knowledgeable professional by providing helpful content and interacting with your network, your SSI score is likely to continue to rise. But don’t worry about the number too much – LinkedIn, like all other social networking platforms, is about building genuine connections with people. We have a great single module course on LinkedIn. It’s got everything you need to become a power player and is just €99.